The Ellis Team at RE/MAX is accepting new listings. We’ve sold practically everything and we’re ready to help more people. If you haven’t heard this before, you probably will in the future. It should be a common theme. Prices have been rising, that’s well documented. Let’s illustrate why. We’ve created a few graphs that show official inventory levels and added a month’s supply of inventory graph. Last month only 868 new single family listings came to the market compared to 1,413 at this time last year. Fewer listings coming to the market shows why we have fewer listings on the market today than in months past. Officially we’re down to 4,169 single family homes which includes villas and duplexes. It also includes Charlotte, Hendry, Collier, and Glades county properties listed in our MLS. In the coming months those other counties will be dropping out of the official numbers, so look for Lee County numbers to fall even further. Combining a trend of less properties coming to the market each month is the market’s ability to absorb everything the supply side throws at it. Let’s just say the demand side’s appetite is larger than the supply side’s ability to deliver. If you’ve ever hear the phrase “Your eyes are bigger than your stomach” you know the concept. Well, in this case, the eyes aren’t bigger. The stomach is easily devouring everything it sees. Buyers in many cases are in bidding wars. That’s not to say transactions are easy. In fact, perhaps they’re more difficult than ever to close. This market has a large appetite, but it needs teeth to chew on it and fully digest what it’s about to consume. Some properties have title issues. For instance, we’ve been working to close a file that had an open pool permit from years ago. Another had old code violations that must be cleared up including hearings with the city or county. All these take time, and some buyers aren’t willing to wait. We’ve seen buyers walk believing they can just go find another great deal. That’s until the realization sinks in that they might want to hang in there on their current deal because the alternatives may not be as nice, and may cost a lot more. And who’s to say the slim pickings left on the market don’t also have unknown issues that need to be worked on. Though frustrating it may be worth it to hang in there. Professional agents are the teeth that get in there and chew on the issues and get them worked out. In the end, everyone is happy, but it can be frustrating when you’re scheduled to close only to find out a week before closing there are issues that will take some time. We tell our buyers not to get too attached to the closing date on the contract, because issues have been creeping up that must be dealt with. 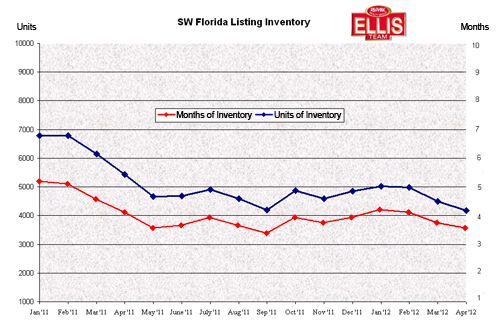 When you look at the month’s supply of inventory standing at 3.5 months, you quickly realize buyers are not in the driver’s seat right now. Choices are slim, prices are rising, and time is ticking. Buyers want to capitalize on this buying opportunity with lower prices, low rates, etc. Buyers should realize the seller or the title company isn’t the enemy. The competitor is other buyers. If a buyer opens up that contract even for a second, it gives another buyer the chance to swoop in and take it. When you find a property you like, ask yourself how much more will this property cost me down the road if I wait? Ask yourself, what if I don’t find something I like as much? Back in 2009 properties were entering the market fast and furious. Times have changed, and the selection just isn’t there. Don’t be discouraged. There are great properties out there, and more coming. You just have to be educated ahead of time so when that great deal comes, you’re ready to pounce. The time to learn the market isn’t when the property hits the market, it’s before. If you wait to learn, you’ll have your lunch handed to you by another buyer who took the time to seek advice before their desired home hit the market. And if you encounter a few hiccups, work with an agent who’s used to digging in and getting problems solved. As the market continues to rise in value, you’ll be glad you did. Good luck and happy house hunting. Call the Ellis Team at 239-489-4042 if you need the assistance of a professional. Posted in Southwest Florida Real Estate.Tagged Ellis Team at RE/MAX Realty Group, Lee County Florida.